This beautiful part of the Yorkshire Dales is only half a mile from East Witton and three quarters of a mile from Middleham. The Cover Bridge Inn, situated between the two bridges over the River Ure and the River Cover, is an old coaching inn which was once called the Forresters Arms and before that the Masons Arms. It is at this point that the ancient road from Richmond and the North crossed the River Ure then continued up Coverdale. The River Cover starts as a tumbling brook below Great Whernside and soon becomes a shallow and fast flowing river down Coverdale into Middleham and then through a gorge to meet the River Ure just beyond Cover Bridge. The River Ure is 74 miles long flowing from Ure Head on Abbotside Common through Wensleydale to Cuddy Shaw Reach near Linton-on-Ouse where the river changes its name to the River Ouse. 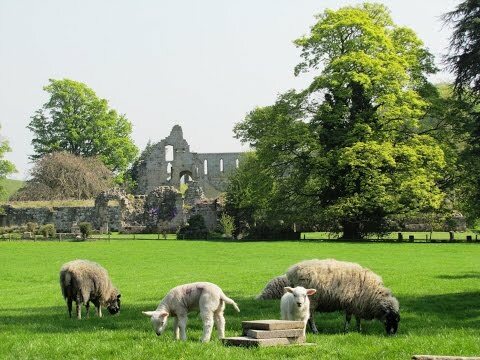 Jervaulx Abbey, founded in 1156, was a Cistercian Monastery and daughter house of Byland Abbey. The abbey is now a ruin and very popular with visitors and tourists. It was purchased by its present owners, Major and Mrs WV Burden, in 1971 and is the second largest privately owned Cistercian abbey in the UK. In the 16th century during the dissolution of the monasteries the abbey was severely ravaged and pillaged, stipping its roofs of lead and its church was blown up with gunpowder, and was declared forfeit to the crown. The beautiful and historical Jervaulx Abbey is famed for having over 180 species of wild flowers among its walls. Opposite the abbey the Jervaulx Abbey Tea Rooms offers relaxing refreshment for visitors, walkers, cyclists and there are full facilities for the disabled. At the back of the Tea Rooms stands a magnificent model of Jervaulx Abbey as it would have looked in about 1530. Thornton Steward is a small pretty village in the Richmondshire district of North Yorkshire. The school house was founded in 1815 but was closed during the 20th century. St. Oswolds Church, situated apart from the village, was founded in the 11th century and is mostly Norman built on Anglo-Saxon foundations. This extremely old church was subject to Channel 4’s show “Time Team” where they found remains of a communion of monks. Not far away is Danby Hall a massive ancient stone mansion. The oldest part of the hall is said to have been erected in the 14th century and on the balustrade round the top of the house is the date 1658 indicating a restoration at that time and then restored again and the south front rebuilt in 1855. The hall and estate remained in the Scrope family from late 16th century to the 20th century. We drive over the bridge opposite Cover Bridge Inn and turn right at the bend in the road we park our car in the parking area. We walk back along the road to the bridge over the River Ure and continue forward to Cover Bridge Inn where we turn left. We then go over Cover Bridge and take the footpath on the left to follow the River Cover for a short way until it meets the River Ure. We then follow the River Ure observing Sand Martins, Pied Wagtails, Black Headed Gulls, ducks with ducklings and Shelducks. We pass a large pond on the right and carry on forward until we reach a gate. We go through the gate and the track turns right up to the road (A6108). We then turn left onto the road and walk round the bend to Jervaulx Abbey on the left and Jervaulx Tea Rooms on the right. After indulging in an ice cream at the Tea Rooms we cross the road into the abbey grounds. We make our way into the ruins of the abbey and have a tour round. We then leave the ruins and make our way to the track and turn left following the track through the grounds. We pass the fishing ponds and then arrive at the gate and gate house. We carry on walking straight ahead on the road which bends to the left and past Kilgram Grange. We walk over Kilgram Bridge and take the footpath on the left. We walk over two fields then turn right immediately up the side of the third field with the hedge on our right. We come to a gate and go over the stile to the right hand side. We follow the hedge line on our right towards Woodhouse Farm. We then turn left at the brown barn and follow the footpath walking through the fields towards Thornton Steward. We walk through a field with a water trough and a spring for the animals to drink from then through a narrow field then onto a track at the back of some houses which takes us to the road. We turn left onto the road and walk to the end of Thornton Steward village. We pass a water well and some toilets before we take the footpath through the gate at Manor House. We now follow the track through the trees to St. Oswold’s church. We take a good look round then carry on forward through the fields until we see two footpath signs, we take the left one through the gate in the wall. We now pass Danby Hall on the right and pick up the track to Danby Low Mill which takes to our car. An easy, mainly flat walk. Approx 7.25 miles using OS map Explorer 302. Cover Bridge is approx ½ mile from East Witton and ¾ mile from Middleham in the Yorkshire Dales. From the A1 take the A684 towards Bedale and Layburn. After passing Harmby and just before reaching Leyburn take the left turn onto the A6108. At the Cover Bridge Inn take the left turn then immediately right after the bridge. There is a parking area just on the bend with a bridleway to Thornton Steward. There are some toilets in Thornton Steward. For refreshments there is the Cover Bridge Inn next to Cover Bridge and the tea rooms at Jervaulx Abbey.